These are notes from the Mailman sprint at PyCon 2012. They are not terribly well organized, nor fully fleshed out. Please edit and push branches to `Gitlab`_ or post patches to the Mailman bug tracker at <https://gitlab.com/mailman/mailman/issues>. The intent of this document is to provide a view of Mailman 3’s workflow and structures from “eight miles high”. Mailman accepts a message via the LMTP protocol (RFC 2033). It implements a simple LMTP server internally based on the LMTP server provided in the Python standard library. The LMTP server’s responsibility is to parse the message into a tuple (mlist, msg, msgdata). 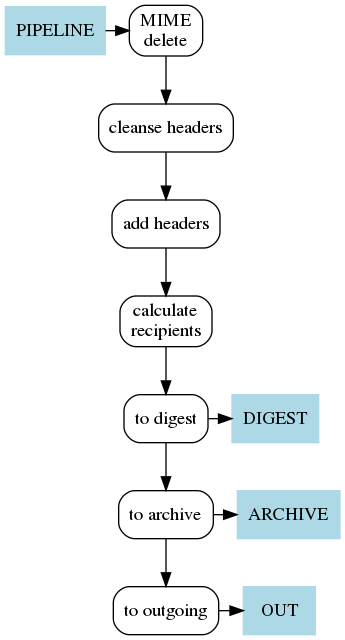 If the parse fails (including messages which Mailman considers to be invalid due to lack of Message-Id as strongly recommended by RFC 2822 and RFC 5322), the message will be rejected, otherwise the parsed message and metadata dictionary are pickled, and the resulting message pickle added to one of the in , command , or bounce processing queues. Handlers may copy messages to other queues (e.g., archive ), and eventually posted messages for distribution to the list membership end up in the out queue for injection into the MTA. The virgin queue (not depicted above) is a special queue for messages created by Mailman. Mailman 3 uses lazr.config, essentially an “ini”-style configuration format. Each Runner’s configuration object knows whether it should be started when the Mailman daemon starts, and what queue the Runner manages. mailman : This is an ubercommand, with subcommands for all the various things admins might want to do, similar to Mailman 2’s mailmanctl, but with more functionality. bin/master : The runner manager: starts, watches, stops the runner daemons. bin/runner : Individual runner daemons. Each instance is configured with arguments specified on the command line. A user represents a person. A user has an id and a display name, and optionally a list of linked addresses. Each address is a separate object, linked to no more than one user. A list member associates an address with a mailing list. Each list member has an id, a mailing list name, an address (which may be None , representing the user’s preferred address), a list of preferences, and a role such as “owner” or “moderator”. Roles are used to determine what kinds of mail the user receives via that membership. Owners will receive mail to list-owner, but not posts and moderation traffic, for example. A user with multiple roles on a single list will therefore have multiple memberships in that list, one for each role. Roles are implemented by “magical, invisible” rosters which are objects representing queries on the membership database. Each list style is a named object. Its attributes are functions used to apply the relevant style settings to the mailing list at creation time. Since these are functions, they can be composed in various ways, to create substyles, etc.